This answers the third Un-Stick Your Memoir question — How to organize your project, from a couple weeks ago. Figuring out how your brain works best with storytelling will save you much wheel spinning frustration later. Trust me on this! Chronological—the most popular and for most folks often the easiest way to get started. However, don’t get stuck on this. Start with a key event and build forward and back around it. Theme— Think about the kinds of stories you like to read or hear, this may help you choose a theme that naturally resonates with you. What you’ve learned in life? Adventures? People who have impacted you? Your faith? Your family? “Would you be where you are now if that event had happened differently?” these make for good reading and are probably already a part of the way you relate your story. Of course some of you just love outlines—by all means knock yourselves out and outline to your heart’s content! If this is how your brain likes to organize then work with it. If, however, you are a “fly by the seat of your pants” type of person, toss the idea of an outline away, wipe the cold sweat off your brow and work with the method that comes naturally to you. 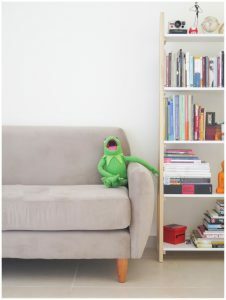 I believe that even the most dis-organized person has developed ways to organize their life. They cope and compensate, tapping into what works well for them. to a method that is foreign to your way of thinking. Now, here are three ways to approach the nuts and bolts of gathering the pieces of your story. Whether you’re using the oral recording method (click to see last week’s blog) or writing, these will work. I’ll discuss the written method here as I am a visual and tactile learner and need to see my project and touch it. If you thrive on oral, then adapt these methods to the recorder, talking out your story. You can use the containers/folders for storing your photos and memorabilia prompts. I’ve personally used all 3 of these methods and they all work. Label whichever version you’ve chosen with general titles. You’ll be surprised how many will later become chapter titles as you think of descriptive phrases or pivotal events for each section. The key is that when ideas come to you, or you find mementos and photos that go with each piece of your story, you will put them in the folder, box or file they belong in. Countless great writers have grabbed whatever was at hand at the moment and written snippets of a story, or a song lyric or a rough poem idea. Napkins, the back of your hand (a bit hard to file, but you’ll figure it out), a scrap of newspaper. expecting ideas somehow breeds ideas. Spend some time letting your thoughts mull and simmer in your conscious as well as your subconscious, and tuck the idea pieces in their “home” like stray puppies as they come to you. Give yourself a limited time as that will encourage you to focus. Say, 2 weeks. a task and a time frame. At first it might seem nothing is coming to you, but wait for it! Once having given your brain its main job, you will come up with ideas— in the shower, walking the dog, mowing the grass, tucking your little one into bed or hearing your mom or dad tell that same story ( I know you love it) again. Relax, it will happen! Pull everything together at the end of that time and start filling out the gaps. Pick a section, folder, box and focus just on that till you have everything down that you can remember pertaining to that topic or time. This is just brain dump time. No editing yet! If you’ve made it this far and are still stuck, give me a call and let me help you get back on track and moving forward. I’d love to hear what steps you’ve taken and what is working for you. 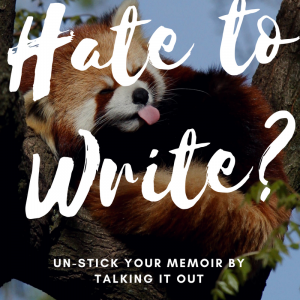 Un-Stick Your Memoir Part 2: What if You Hate Writing? “I hate to write, how can I do this?” As I mentioned last week, this is a sticking point for some folks. 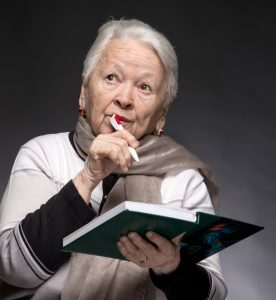 They’re great oral storytellers but the thought of writing those stories and memories down gives them “test anxiety” at the least and “the screaming mimi’s” at the worst. Never fear-there are a few different ways to handle this, don’t let it stop you! With the help of a handy little voice recorder you can just tell your story. Carry it with you, turn it on, record, pause or turn off till you’re ready to tell your next story, or continue with your thoughts. You can collect memories in a stretch of reminiscing over photos or with family. Or maybe just relate brief thoughts or impressions as they come to you throughout the day. Don’t worry that they’re not in order. That is the beauty of digital recording and computers. 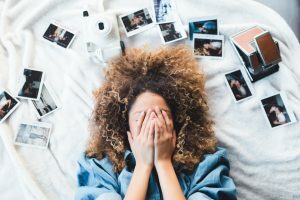 While it will save you some time and help you focus if you have a plan and go through your life story memories somewhat chronologically, it isn’t critical. Thanks to the beauty of downloading and cut and paste, your lovely, moving or humorous stories can be rearranged into whatever order you choose later. I show this tiny workhorse at workshops and folks repeatedly ask what model it is and where they can get one. There are many different brands out there in a range of prices. The Olympus model has been a great fit for my work and has had excellent reviews on quality, clarity and ease of use. It also lets me record in different files to keep projects separate. This makes downloading to separate computer folders even easier. The recorder runs on a two AAA batteries and has great battery life. I have found that Procell by Duracell batteries have excellent performance and reliability and have switched to using them exclusively in my work. Both are high quality items that will do the job and serve you well. Whichever one you choose, based on features or price, they all work pretty much the same and will make telling your story easy and fun. Keep the recorder with you, it will serve as your ever-ready personal assistant. Starting with the technique in the last blog post, go ahead and brainstorm your memories and story ideas into the recorder. Then, when thoughts come to you or you want to expand on some stories or reminiscence over visual prompts such as photographs, you’ll just talk your story out into the recorder. A recorder such as the Olympus holds about 24 hours worth of audio recording. I use mine regularly for interviewing and as an extra note-taker when I’m at meetings and need to be able to go back and fact check or review content. It will help you focus on the story and not on trying to write your notes legibly, a challenge for me, that’s for sure! 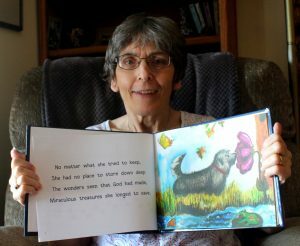 Later, when you’re ready to download your stories, just plug the recorder into your computer, transfer the files and you now have your oral history recording in a format that can be easily transcribed into written form. Voila, “test anxiety” gone! Solution 2 – Team up with a friend to record each other’s stories. Again, this taps into the power of oral story telling. It also adds in the fun of having a buddy to tackle the project together. Find a friend who is either interested in also telling their own story or is intrigued with you and yours. Remember, this is not a never ending time commitment nor a long term project. Getting these stories down will take a focused-10-12 hours of recording time, spread out over a handful of sessions. I’d recommend setting aside time once or twice a week for about a month. Of course, the beauty of this is that you can work around your own schedules. Then, either use the voice recorder (I do recommend this as it helps you go back at your leisure and capture the full nuance of the story. For family members and friends, having a recording of your voice is a priceless addition to your story—why not do it?) Or, you can take turns with your friend, interviewing each other and taking notes on each other’s stories. This takes away your fear of a blank piece of paper, you just tell the other person’s story. The fun of the buddy system will keep you both on track and accountable. A multi- strand cord is stronger, tag-teaming with a friend or another family member will help you both to succeed. Thanks and Happy Story Telling! What’s Got You Stuck? Here are three challenges I hear most often at workshops and coaching consultations. I have so much material I don’t know where to start. I hate to write, how can I do this? I don’t know how to organize this project. These problems are not insurmountable! In fact, sorting them out is a fun way to help you get started making your project a reality. I’ll try to answer each of these concerns over the next couple weeks but let’s just take the first one today. Where to start when you have so much material? Pick a point in your life that you most enjoy revisiting or telling stories about. Is it your childhood? Travels? Your experiences raising your own family? Starting at a time ripe with good memories is a way to build positive momentum and can help shape the theme of your book. You will probably end up expanding your scope but many great memoirs and oral histories stay with a narrow focus. a personal history that delights you and your family. So, here’s what to do today—grab your favorite cup of whatever, sit down with a notebook or your computer and just brainstorm. For this exercise I prefer the old pencil and paper method, there is something about it that helps stimulate your little gray cells. Recall your chosen starting point and write down everything you can think of that relates, even if it seems like a rabbit trail. In this case rabbit trails are good! Don’t worry about complete sentences or even thoughts; jot down words, phrases, events, impressions. One thing that will help is incorporating each of your senses. Write down one idea that relates to this time in your life and covers each of the five senses. What is something you remember the feeling or texture of? Maybe it was your favorite quilt, or a new puppy, or the feel of a plank of wood. Sight—what visual memory stands out? A fishing pole? Your best friend? Taste—what food do you associate with this time in your life? Maybe it was a can of beans your dad opened when you were camping. Perhaps it was home-fried potatoes or Grandma’s pie. Anyway, you get the idea. This mental landing place is the most important geography in your story. It will help you decide what to keep and what to save for another day, another story. It is the place you will begin from and will provide the framework for “the rest of the story” as Mr. Paul Harvey used to say. Let me know how this worked for you—I’d love to hear your ideas! Helping people shift from dreaming and talking about a project they’ve longed to do to holding a finished book gives me more joy than you could possibly know. That’s why I do what I do. Because I love watching my clients achieve the satisfaction of seeing their goals become reality. 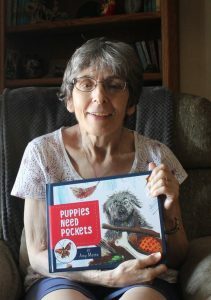 Artist and author Amy Motto completed the draft for a wonderful children’s book, Puppies Need Pockets, almost 20 years ago. However, it had been sitting in her desk while life events, ill health and time moved on. She never forgot about it and longed to see it come to completion. We began visiting about the possibilities earlier this year and I’m delighted to say that this week we ordered final copies of this charming, fun book. The look on her face when she held the physical fulfillment of her dream was priceless! Two boxes of Puppies Need Pockets are on their way to her as you read this and the book will be available on Amazon within a few days. She is thrilled! While I can’t promise that this happens for all of my clients as quickly as it happened for Amy, I have discovered that if you want to complete your book, memoir or life story project badly enough, it’s usually only a matter of time (and high level guidance) before you get there. Plus, the process of moving toward your goal can be lots of fun too! So… do you know someone who has great memories or a life story they’d like to save while it’s fresh in their mind? Or maybe they have a book manuscript hiding in a desk drawer. Are they stuck and need help to get results and move that project forward? I have room for 5 Love Your Life-Story Breakthrough Sessions in my schedule in the next couple of weeks. There is no charge for these sessions but availability is limited to the first 5 people who contact me. I would be honored if you were to share this post with someone who struggles with how to get started, organize or even finish their life story project and wants to feel the incredible satisfaction of completing it. Or email or PM me if you could use some support yourself. I would love to help. Here’s to all of us having the satisfaction of completing that life goal!